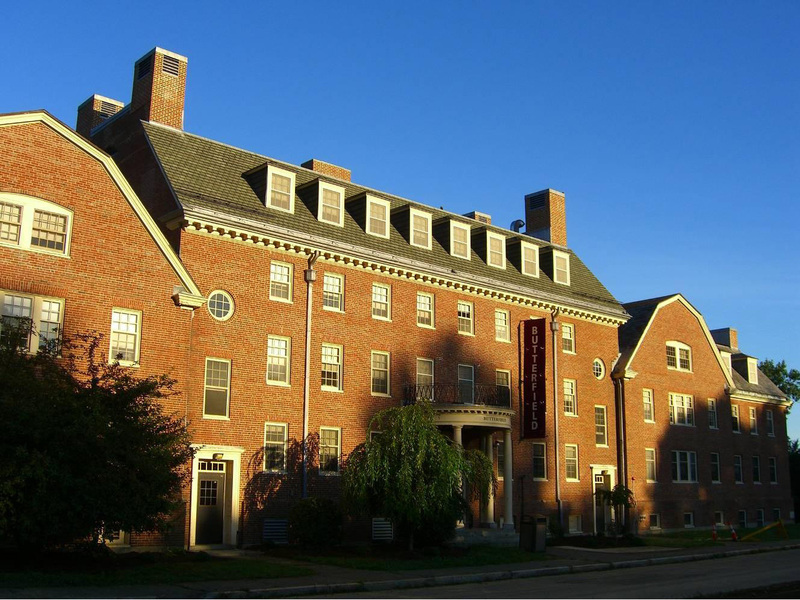 Butterfield House is an approximately 46,000 square foot student residence hall on the Amherst campus of the University of Massachusetts. The building is one of nine structures that comprise the Central Residential Area. All nine buildings were designed and constructed between 1940 and 1963, and sited according to a Beaux-Arts formal plan. Seven of these buildings (Butterfield, Brooks, Van Meter, Greenough, Chadbourne, Baker, and New Africa) were uniformly designed in Georgian Revival style. Wheeler and Brett, which are both sited at the bottom of the hill and constructed last, are less ornate structures and have subtle Art-Deco details. All buildings continue to serve as dormitories in 2008. The main planning axis of the Central Residential Area is perpendicular to the ridgeline of Clark Hill and extends northeast to southwest. The axis is defined by the center of Van Meter and Baker Houses, with the remaining dormitories sited to the north and south. The bilateral symmetry and duplication of building footprints and appearance only deviates with the location of Butterfield House and the design of Brett House. The spatial relationship of the planning axis is visually reinforced by the central block and cupola of Van Meter House. The steep grade of the overall site was graded to create narrow terraces between the individual structures. Butterfield House was completed in 1940 and was the initial building to define the Central Residential Area. It was also the first building designed for the institution by alumnus Louis Warren Ross and began the school's tradition of housing designed in the Georgian Revival Style. The 4-½ story building includes an attic and a full basement level. The building is rectangular in plan, but distinguished by two protruding 3-bay 3-½ story sections with gambrel roofs. The remaining sections have Mansard roofs with regularly spaced dormers. The central 10-bay block is 4-½ stories, while the north and south blocks are each 3 bays and 3-½ stories. With the exception of the three flat areas of the Mansard roofs, the entire surface is finished with shingle roofing. The central block has composite simulated slate shingles, while the wings retain the original slate. The central east entrance doorway includes a demilune transom. The entrance is covered by a half-round Doric portico with supporting a balcony and wrought iron railing. The portico rises above three granite stairs which place the entrance elevation at a split level between the first floor and basement. The building is 3 bays deep, and the north and south elevations are distinguished by varying roof styles and heights. Additionally, the three Mansard blocks are each terminated with brick double chimneys. A common-bond brick pattern is used throughout all elevations, with a molded brick water table and dressed granite base to define the basement level. Copper downspouts include decorative heads. All windows are wood, as well as the dentil and molded cornice defining the roofline and the gable peaks. The façade is defined by a window pattern of primarily double-hung sash. The basement level has both 6-pane fixed windows and 6/6 operable sash. The first and second floors have both 6/9 sash and triple window units of 6/9 and 4/6 sash. The third floor level has 6/6 sash double units of rectangular 8/8 sash in the gambrel ends, which replaced original round-headed sash. Both the third and fourth floor dormers have 6/6 sash. Additional facade details include two entrance doors with wood doorcases and transom windows at grade on the east elevation. The doors access staircases with landings distinguished by inter-floor circular and double hung sash windows. The south and north end elevations have a single door entrance with trabeated wood doorcase and pediment. These doors access open stair halls illuminated by 20/20 with half-round fan lights. The Butterfield House is located on the south side of Clark Hill Road atop a steep hill. The site is terraced with limited views of the campus below. A bituminous concrete vehicular road leads to the house from Clark Hill Road, continuing on along the north side of the building to a bituminous concrete parking lot to the east of the Butterfield House. Bituminous concrete and concrete pedestrian walks surround the house. The landscape features deciduous trees over mown lawn, evergreen trees, and stone boulders. The foundation of the house is planted with deciduous shrubs, evergreen shrubs, and perennials. Bike racks are located nearby. Butterfield House was sited to the south of the historic Y-shaped intersection of Clark Hill Road and Presidents Hill Road, now Chancellor’s Way. A 1943 campus map shows the building set in a landscape of dense vegetation. Historic images show elm trees and sheared evergreen shrubs along the eastern façade of the building and framing the main entrance (no longer extant). Pedestrian access to the building was accommodated by a pedestrian walk off Clark Hill Road that surrounds the building (extant). Vehicular access to the building is provided by an oval-shaped drive that leads to the east side of the building and forms a central court planted with three trees in a row. The addition of parking areas to the east and west of the building recommended in the 1957 Shurcliff, Shurcliff and Merrill Master Plan has changed the landscape and modified the oval-shaped vehicular access drive. In general, the Central Residential Area complex retains a great deal of its landscape integrity, modified by the addition of parking along Infirmary Way, to the east and west of Butterfield House, along the east of Chancellor’s Way, and to the east of Van Meter House. The Y-shaped intersection formed by Chancellor’s Way and Clark Hill Road was removed by 1955 and rerouted to a spur off of Chancellor’s Way located to the east of Greenough House and Chadbourne House that existed since at least 1943. Removal of this portion of Chancellor’s Way enabled the construction of Van Meter House. Many changes in vegetation patterns are the result of new construction, much of which occurred prior to 1959. The loss of foundation planting at Butterfield House, Chadbourne House, Baker House, and Wheeler House, along with the introduction of new foundation planting at Butterfield House, Greenough House, Chadbourne House, Baker House, and Van Meter House has changed vegetation immediately associated with the buildings. The building is named for former Massachusetts Agricultural College President Kenyon Leech Butterfield (1889-1945). Butterfield was also a writer, lecturer, editor, and organizer of the “Rural Life Movement”. During his 18 years as MAC President, he oversaw the construction of 12 campus buildings.